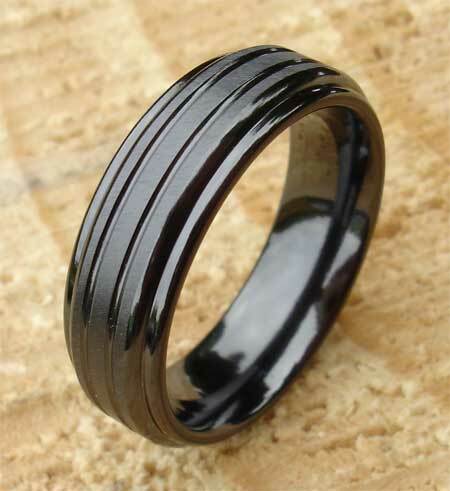 Black Wedding Ring For Men : LOVE2HAVE in the UK! A men's wedding ring made from zirconium and coloured black all over. Zirconium is fast becoming a desirable alternative, especially for men as it is very tough and hard wearing, this UK made wedding ring is a great example. Zirconium can also be styled into contemporary designs to complement modern fashions too, which adds to its versatility. 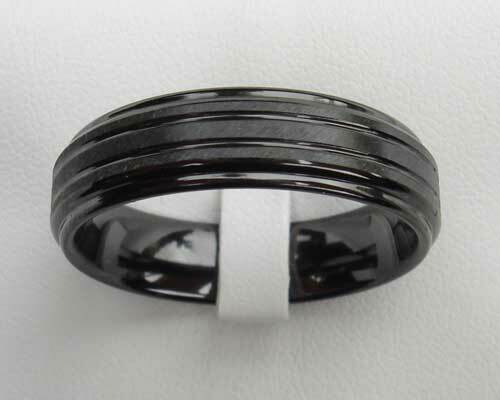 This black zirconium wedding ring comes with a shoulder cut profile with twin engraved rails. The rails have been machine engineered into the stepped profiling of the ring, smoothed into a U-shaping. The model shown here is a satin and polished combination finish, and the available widths range from 6mm to 12mm. Width(s) Available: 6mm to 12mm. Profile(s) Available: Shoulder cut comfort fit.